Waterfront pedicabber Tristan Johnson was taking a phone call before tourists came by and requested a ride to Pike Place Market. 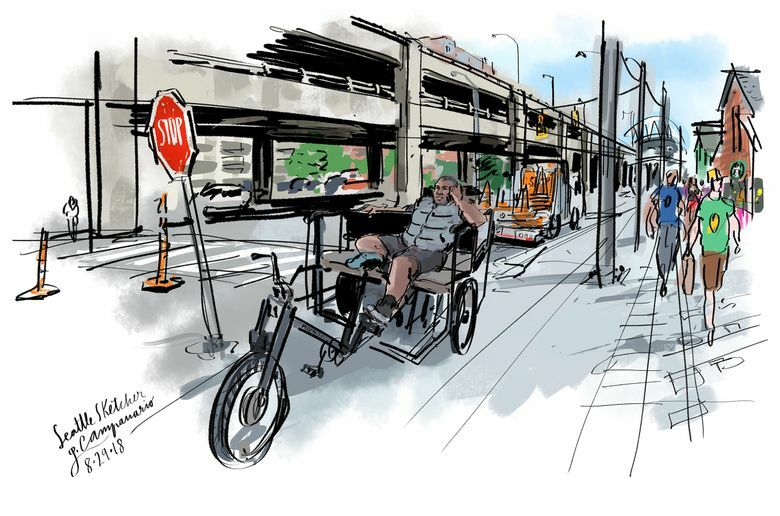 His pedicab is electric, so he returned to this spot near Pier 56 in no time, giving me another chance to to add detail to my drawing. This scene of summer along the downtown waterfront is never going to look the same again. Come next year, there won’t be a big elevated freeway in the background. The Alaskan Way Viaduct is really supposed to be gone. Its demolition is scheduled to begin as early as January. Once the dust settles, the memory of the viaduct will start to fade, too. That’s why I came down earlier this week to start drawing the many viewpoints I’d like to remember. I’ve long considered the viaduct a major obstruction in what has the potential to be a fantastic public space. But I have to agree about the aesthetic. Sketching along the waterfront may never be as interesting as it is now.